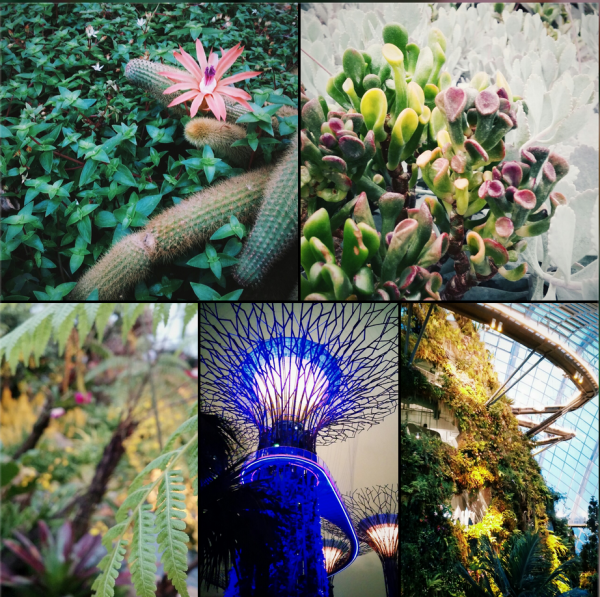 :: Evening trip to Gardens by the Bay :: - Dreams are what you wake up from. We decided to spend the evening by paying a much-delayed visit the the Gardens by the Bay. I have been wanting to make a trip there, but did not want to squeeze and jostle with the hordes of excited visitors in the earlier few months of its inception. This evening turned out to be a good opportunity to pay the gardens a visit. It was also a rather cool evening, making the walk around the outdoor area a very pleasant activity. We got the tickets for the cloud forest and the flower dome. I wanted to see the cloud forest first, but as I approached the turnstile, the attendant kindly recommended making a trip to the flower dome first, since night was approaching. "It will get rather dim over at the Flower Dome, hence it's always good to start there first," she smiled and said. It turned out to be a very good suggestion. The flower dome was very spacious, and I was dazzled by the diversity of cacti and the 'succulents' on display. The flora were segmented by their continent of origin. My only peeve was the Chinese Lunar New Year flower display, which didn't enthrall me. All in all, it was a nice and enjoyable walk around the various segments, but we took less than an hour to cover the grounds. I definitely preferred the cloud forest more. The 35-metre cloud forest was covered with various species of plants, making it a real-life Avatar film set. The cool controlled-climate, with the waterfall and its spray, created a cool and moist climate. We were able to walk at different levels of the "canopy", which allowed us different views of the green structure. At the end of the visit, we also managed to see the OCBC Rhapsody, which somehow reminded me of the musical fountain at Sentosa. Interestingly, there was also a showcase of Singaporean director Anthony Chen's films "Reunion Dinner" and "Ilo Ilo".